EarAngels are ear plugs that attach to your earrings. With EarAngels, your hearing protection can blend in seamlessly with your favorite pair of stylish earrings. With their clear and simple low-profile design, EarAngels let you protect your hearing at the club, at concerts, and at other fun noisy events -- without cramping your style. EarAngels take the edge off of dangerously loud music, letting you hear everything clearly, but at a slightly reduced volume; you can still hear your friends and the music, but your ears won't ring the next day -- and you'll still be able to enjoy healthy hearing a few years down the road. If you're a serious fan of live music or a big club kid, if you're into looking stylish and feeling fashionable, and if your hearing is important to you (and isn't it important to everyone? ), EarAngels and your ears are a match made in heaven. A great way to keep your ears safe and young! EarAngels really are super easy to use. Just put in one of your earrings like normal, and then just slide the loop at the end of the EarAngels ear plug over the back end of your earring stem, behind your earlobe. This works with both hook and post/stud style earrings. Repeat the process for both ears, and you're ready to roll! Just insert the plug tip of each EarAngels ear plug into your ear canals for a comfortable seal against noise when it's time to protect your ears from hazardously loud noise, and remove the ear plug tips and let them dangle gently from your earring stems when not in use. Say goodbye to ringing ears the day after the show. Say hello to EarAngels: style + convenience + hearing protection = victory. With NRR 23 protection from noise, EarAngels are ideal for a wide variety of applications; designed with concerts, music festivals, and clubs in mind, EarAngels also let you bring style and protection to auto races, airplane trips, and anywhere else you want a little peace and quiet. These ear plugs are washable, reusable, and recyclable. One pair will last for many outings with a little care and cleaning, and a compact and handy squeeze-to-open storage pouch (included free!) will let you keep your EarAngels in your pocket, your purse, or even your favorite itty-bitty teeny-tiny clutch, so you never have to be without your hearing protection. Protecting your ears with EarAngels is cute, sensible, and inexpensive, so what are you waiting for?! Even musicians use them! 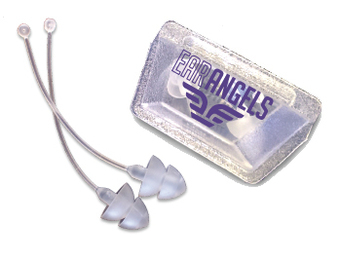 EarAngels are proudly made in the U.S.A.
Includes one pair of EarAngels ear plugs and free storage pouch. Earrings not included.